After a walk through the park with our friend Rachel, Zak and I decided to go to the grocery store and pick up some fresh fish and something fun from the produce section to enjoy for dinner tonight. I was extremely happy to find some lovely fresh morels and royal trumpet mushrooms for $15.99/lb. (and another awesome seasonal ingredient I’ll be preparing tomorrow!). I’ve been reading about both varieties of mushrooms, though especially morels, all over my frequently perused foodie websites but was scared off by the often prohibitively-expensive prices. By keeping the amounts somewhat modest, I was able to sample both of these treasures without breaking the bank. I adapted the mushroom portion of this recipe from Cleveland’s own Michael Symon’s Live to Cook, which my mom got me a signed copy of for Christmas a few years back and I’ve been slowly working my way through and absolutely loving. The mushrooms were absolutely delicious, due more to the quality of the ingredient than my cooking skills. Both had a delicious, earthy flavor and gorgeous texture. 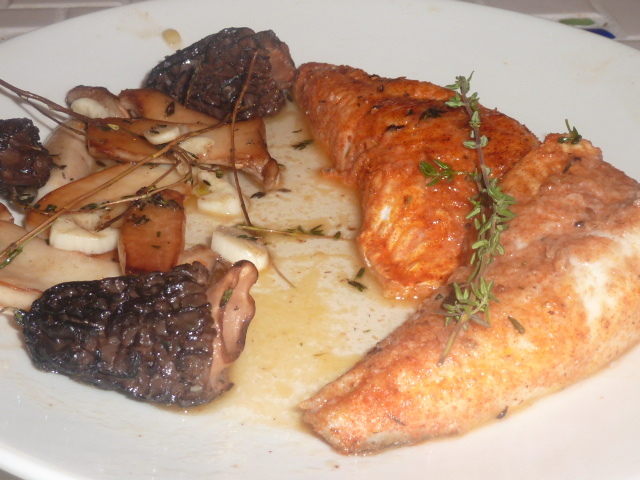 The fish was delicate and balanced well with the rich mushrooms. Finally, the white wine sauce added a touch of sweetness that tied everything together. The only bad news here is that now I am officially smitten with mushrooms that tend to be way outside of my price range and available only for a limited time of year. Such is life, I suppose. Whisk together flour, dried thyme, paprika, kosher salt, and freshly cracked black pepper. Lightly dredge perch in flour mixture. In a large non-stick pan add canola oil and thyme sprigs. Heat canola oil over medium- high heat until rippling. Add fish, being sure not to overcrowd the pan, and cook 4-5 minutes per side until golden brown and cooked through. Remove to a paper-towel lined plate to drain. Add wine to the pan. Bring to a boil and whisk in butter. Let reduce by half. Pour over fish and seared wild mushrooms (see below). Slice the royal trumpet mushrooms lengthwise so they are about 1/4″ thick. Heat a 10″ cast iron skillet over medium-high heat for 20-30 seconds. Glaze the bottom of the pan with the oil. Lay in the royal trumpet mushrooms. Be careful not to crowd the pan. Sprinkle with kosher salt and add a few sprigs of thyme. Sauté, turning the mushrooms once to brown them, about 3-4 minutes per side. Remove from pan and set aside on a plate. If necessary, add another tbs. or so of oil to the plan. Repeat the process with the morel mushrooms, seasoning again with kosher salt and sprigs of thyme. I apologize for the hiatus between posts – we were having some problems with the oven, my first week of school started, and I’ve been having some computer troubles. Regardless, this dish was absolutely delicious. 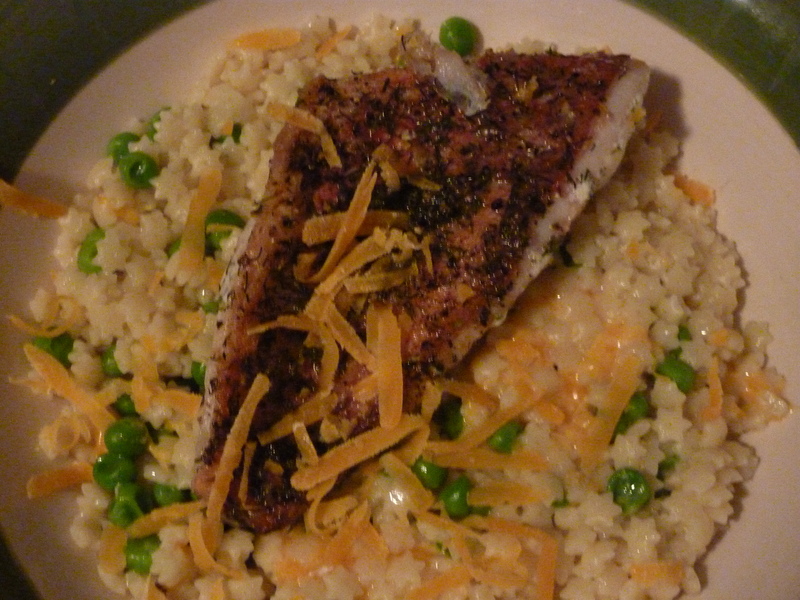 The crispy, salty skin of the fish was the perfect offset to the soft, creamy texture of the pasta stars, sweet peas, and cheddar cheese. Not only was this dish extremely tasty, it was fast and easy as well. Season the perch fillets on both sides with salt, freshly cracked black pepper, and dried dill weed. In a small saucepan, add peppercorns. Add butter and slowly melt over low heat. Once melted, add milk or heavy cream and bring to a simmer over low heat. Simmer 2-3 minutes and remove peppercorns with a fork (I missed a few and they weren’t obtrusive in the end product). Add peas and continue to simmer. Meanwhile, in large skillet heat olive oil. Add seasoned fish, skin side down, and sauté 3-4 minutes until skin is crispy and brown. Flip and sauté an additional 2 minutes until cooked through. Set aside. Drain cooked pasta and toss with pea and butter sauce. Add shredded cheddar and stir to combine. Serve perch over pasta with extra cheddar for garnish.